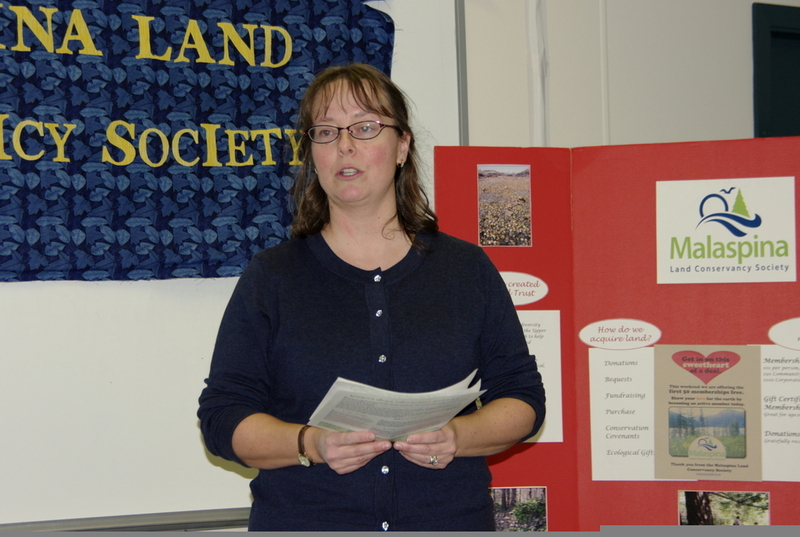 Please join us for the 2014 annual general meeting for Malaspina Land Conservancy Society. It will be held at 7.30 pm on Tuesday, November 18, 2014 at 3852 Gordon Avenue, Powell River BC. If you intend to attend, please drop us an email at info@malaspinaland.ca so we can send you the AGM information. It has admittedly been a while since this website was last updated. This speaks to a need for more members to join our organization and to take a position on the board. We welcome anyone and everyone to share in preserving land for the generations who follow. We have committees already formed and are open to new committees for new projects as members with ideas come along and share. A copy of our minutes of any of the previous annual general meetings up to 2013 is available if you contact us. After our 2014 AGM, the 2013 minutes will also be available. These are a good way of catching up on how the society has been progressing since it first began in the spring 2008. But, the best way of finding out more is to attend our 2014 AGM. This year we assisted with Earth Week Powell River, an initiative which closely matches our own mission of protecting land. We have also formed into a close alliance with local land trusts and similar organizations in the Salish Sea area. We are actively interested in preserving Stillwater Bluffs, an iconic landscape south of Powell River where coastal bluffs sport a mixture of coastal Douglas fir and coastal western hemlock ecosystems. To vote on any issues at the AGM you need to be a member in good standing for the year 2013/14. If your membership has lapsed, please visit the membership renewal page on this website and renew online, or drop us an email info@malaspinaland.ca or snail mail. We will take memberships for the current year until midnight Tuesday, November 11, 2014. If you do not wish to vote at the AGM, we encourage you to renew your membership so you will be a member in good standing as we enter the 2014/15 year. Membership dues remain as always at $10 per person, $30 per non-profit organization and $100 per corporation/business. We hope you will join us on November 18, and if unable, then please join us as a member for the 2014/15 year. Thank you. We held our annual general meeting on November 15 and now have five board members. The meeting went well and thank you to all who attended. We have adopted the Canadian Land Trust Standards and Practices as a guideline to our organization and will work toward incorporating the guidelines into the work of Malaspina Land Conservancy Society. Our guest at the AGM was John Dove. John lives on Texada Island and is well known over there for his hiking leadership and vast knowledge of natural history and geology. He came to our AGM to update us on a large parcel of land on the northwest coastline, half of which is privately owned and half Crown land. There is an initiative to put the area (which is about 1,200 acres and includes about seven kilometres of coastline) into a park. MLCS is interested in being involved with this initiative. It will involve fundraising to purchase the private land, which means MLCS will be entering into a large-scale fundraising campaign in the near future. This campaign will be longterm. MLCS will be creating a plaque to commemorate one of our members who died in August, 2012. Martin Rossander was a firm supporter of MLCS and we will miss his dedication to sustainability and forest preservation. The plaque will be placed at the tree which has been planted in his honour at Willingdon Beach during a celebration of Martin’s life in February 2013. Rob Southcott and Anne Parkinson have joined the board to work together with Janet Southcott, Wendy Cocksedge and Lesley Thorsell. To find out more about MLCS feel free to send us a comment to this site. As November approaches it is time once again to prepare for the Annual General Meeting. This is usually held in the first week of November and the exact date will be posted shortly and details sent out to all members. Over the past year we have increased our number of board members to five. Unfortunately, we face two vacating their positions. Having been a board member for three years, Rachel Walker is moving out of town and thus leaving her position as vice-president and land committee chair. We shall miss her input deeply. Angie Davey joined us in the spring as secretary and she has decided to step down from the board and remain an active member. So, we are looking for people to take on being a board member and involving themselves as an active participant of the development of Malaspina Land Conservancy Society. Positions of secretary, treasurer and vice-president, as well as committee heads for the Land, Fundraising, Membership and Public Engagement committees are available. Currently, leadership of the above committees is done by the board, but we need to form strong membership around each committee with interested and knowledgeable leaders reporting to the board. We have been asked to assist with the preservation of a large piece of land in the area which could potentially involve a multi-million-dollar long-term fundraising campaign. The board has considered the value of participating in this and would like to proceed. Members will receive more information once details have been ironed out. Innovative fundraising ideas will be required including participation of many people in the campaign. This is one of various opportunities coming our way to help preserve land of natural Canadian beauty. It is an example of why we need the strength of a dedicated and willing board. At our annual general meeting in November 2011 three of our directors, Janet Southcott (nee Alred), Rachel Walker (nee Botting) and Lesley Thorsell remained on the board. Since then we have added Wendy Cocksedge to our board. This is all good news. Our organization has been progressing through foundation work…forming, becoming non-profit, becoming charitable, and creating our strategic plan. We are now starting to put together and submit proposals for land interests, which is very exciting, and our board members will soon be focusing more directly on the actual work of a land conservancy rather than the setting up of the organization. But, don’t mistake this to mean we have done all the setting up. Recently, Rachel and Janet attended a board governance course and came away after five weeks realizing that there is still one heck of a lot of things to do. So, we are looking for more people to not only become members but to become active in the work of the board and on committees. This is an exciting time to be involved and for anyone considering doing so, please contact us at info at malaspinaland dot ca. At the AGM we showed three short films to emphasize the work of land conservancies. For anyone not able to attend the AGM, click on the following links to access these inspiring films. http://www.youtube.com/watch?v=WdabcHZ820E which is about the Friends of Mississippi River and is almost 7 minutes long. http://www.youtube.com/watch?v=iX5yT7QSyc4 about children and the wilderness, with last child in the woods author Richard Louv, 14 mins long. http://www.youtube.com/watch?v=huO_NRn34GI which is a great little film about raingardens as well as other ways of slowing down water runoff, 9 mins long. Just to backtrack a little, back in the fall, 2011, we were delighted to receive a donation of $150 from Powell River Community Foundation. PRCF created Powell River’s Vital Signs report. The foundation decided to calculate carbon offsets to compensate for the energy used to create the report. The sum of $150 was determined and MLCS was the recipient of the funds. We decided that we will hold the funds and use them specifically for adding more trees to the environment. We intend to do this with any carbon offset money we receive as it seems to be the logical use of such funds. It is time, once again, for our Annual General Meeting, and we hope that all members and anyone wishing to know more about Malaspina Land Conservancy Society join us on Thursday, November 3 at 7 pm at Vancouver Island University Powell River campus’s room 148. This year we are looking for new directors. Five of our directors, who have given many hours and dedication to the society, are stepping down. This includes Paul, who has been our Treasurer for the past two years, and has provided us with legal advice over the past three, and David, our secretary and membership committee chair and the person responsible for our website. Both David and Paul have been with MLCS from the start. Also leaving us are Maureen, Judy and Nola. However, all remain as members. We intend to involve membership more this year. Since our conception we have worked hard to form a strong foundation. It is now time for us to become more active in pursuit of our objectives. We hope that many members join us for the AGM. If technology works, there will be a couple of short videos about how other land conservancies are preserving land. To vote at the AGM you must be a member in good standing in the current year as of one week prior to the AGM. Membership is $10 per person. Membership renewals for the 2011/2012 year will be available at the AGM. To find out more, see an agenda for the AGM, view the Proxy voting form or the membership renewal form, click on the attached PDF. Free membership is being offered for one of Powell River’s newest charities. Malaspina Land Conservancy Society (MLCS) has received a gift from a generous member who has pledged to sponsor the first 50 new members of the society for one year. The gift is provided to increase public recognition of MLCS and involve more people in its development. MLCS was formed to assist private land owners, whether individuals, industry or businesses, with decisions relating to the preservation and conservation of their land. “We do this by holding an interest in the land,” said MLCS President Janet Alred. An interest could take the shape of ownership, or a conservation covenant that is placed on a specific area of the property. Members of the society are invited to participate in field trips to locally preserved land, will have the opportunity to learn about land restoration and can help on many projects, including committees such as membership, public engagement, fundraising and land. MLCS will have an information table at the Powell River Film Festival on Thursday, February 17 through Saturday, February 19 at Powell River Recreation Complex. Yes, you read that right… thanks to our very generous member for a great idea! Here’s to all our new members.